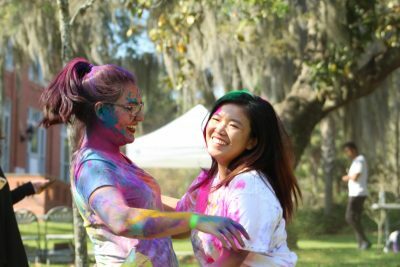 To join in the world’s biggest festival of color, Holi, the Asian Pacific American Coalition recently brought the Indian spirit to Stetson’s Forest of Arden. 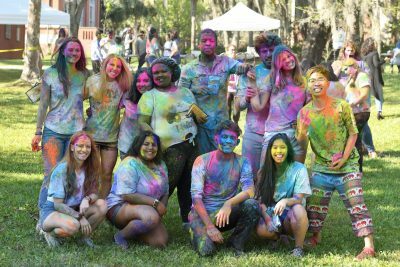 During the last few weeks of March, nearly 150 students participated in the event where they can paint one another with color powders while enjoying fun and laughter. 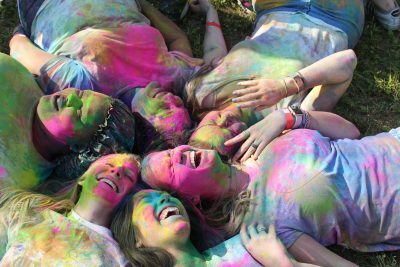 Even though it was hard to match the scale of the famous Hindu festival, Holi, in India and South Asia, every participant gave their best and nobody was afraid to get messy. The festival signifies the arrival of spring and the blossoming of love. It is a time when people gather to play and laugh, forget and forgive. It was this spirit that APAC was trying to bring to the Stetson campus and we did. In the past, APAC has hosted large cultural events, such as the Lantern Festival that attracted up to 400 Stetson students or the Thai New Year Water Festival “Songkran,” which will happen again on April 17t this year. Since Asian festivals are extremely diverse and differ from region to region, APAC always tries their best to deliver the major ones as authentic as we can through the activities that we prepare and the careful selection of food to serve. All of these are made possible by APAC Executive Board members and volunteers with the idea of diversifying the Stetson environment and establishing a cultural presence within the university community. Thus, it has been phenomenal seeing the growth of APAC over the past few years with the support of Stetson community. If you are interested to learn more about APAC — the 2018 Organization of the Year — you can simply join us on our social media, both Facebook and Instagram, or email us at apac@stetson.edu. Our meeting is every other week on Mondays in the Cross-Cultural Center (Tri-C) at 6 p.m.